~ ~ ~ EPC Updates ~ ~ ~: FOSS4G North America Coming to Minneapolis!!! FOSS4G North America Coming to Minneapolis!!! Event Description: FOSS4G brings together public and private-sector stakeholders, innovators and developers who are at the forefront of free and open source software for geospatial applications. FOSS4G-NA 2013 will offer a broad program to discuss and build tools to help solve some of the world's most pressing problems and business needs. Comment: As readers of this blog may know, the Minnesota geospatial community has been involved in the Free and Open Source Software for Geospatial movement from inception. 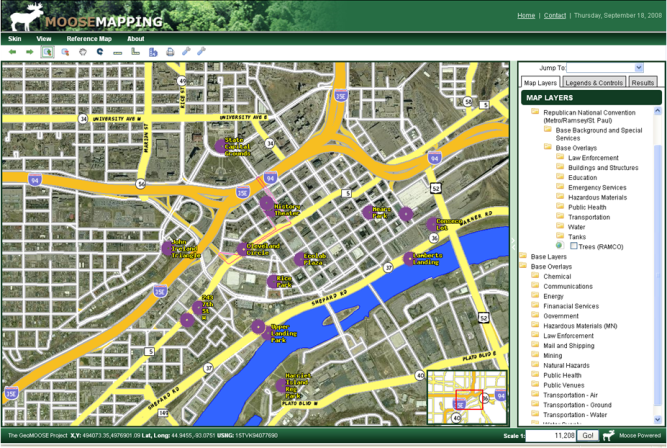 Consequently, the EPC used GeoMoose to create a Common Operating Picture (COP) for the 2008 Republican National Convention (graphic above), and to create a real-time situational viewer and online U.S. National Grid map distribution node during the 2009 Red River Valley floods. Additionally, information about the Computer Aided Dispatch (CAD) program "Tickets" (see: Tickets – The FREE Open Source Computer-Aided-Dispatch and Situation Awareness Software) has proven to be one of the most popular posts on this blog. So it's exciting news to hear developers of free software that has great value and utility for the Emergency Service Sector will be coming to town next spring. Hope you will be able to join us at the event!